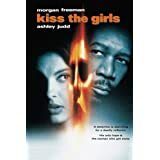 To wrap up Ashley Judd month and segue into Morgan Freeman month we are reviewing the 1997 thriller, Kiss the Girls. This James Patterson novel-turned-movie is an excellent film with all the bells-and-whistles expected from a Drama – Crime- Thriller – Serial Killer movie. If you read the book and found it to be a page turner, hold on to your seat because this movie adaptation is fast paced and riveting. It will definitely keep you engaged until the end. Our main character, Alex Cross, portrayed by Morgan Freeman, is a Washington D.C. cop and forensic psychologist. He learns that his niece, Janelle is missing and decides to go to Durham, NC, where she attends college and meet with the local authorities to see what he can find out about her disappearance. While there, after waiting for hours, basically being ignored, he decides to look around on his own. He wanders into a crime room where he sees bulletin boards displaying photos and information regarding eight missing women, his nieces’ information included. In walks the local police, who apologize for his long wait, off-handedly insult him, and then share with him information regarding a serial killer on the loose who calls himself Casanova. Next, we are introduced to Ashley Judd’s character, Dr. Kate Mctiernan who is described as a strong woman. She is a skilled, caring doctor. She’s smart, beautiful and an accomplished kick boxer. You can’t get any better than that, right! Well, Casanova agrees. She will be a perfect candidate for his collection. That’s all I can tell you. The movie soars from there. Overall, character development is first rate in this movie as well as plot and suspense. Judd and Freeman’s performances were top shelf. Even the background music selection was awesome. Kiss the Girls is a must see on your movie watching list. And if you like this movie, you might check out some of James Patterson’s other novel-turned-movies such as Along Came a Spider (2001), another Morgan Freeman portraying Alex Cross thriller or First to Die (2003) starring Tracy Pollan as Homicide Detective Lindsay Boxer, to name a few. What is the referenced name of the popular area around Durham, NC that Cross travels to? Hint: It’s not a square. This entry was posted in Ashley Judd and tagged Ashley Judd, books, drama, serial killer, Thriller. Bookmark the permalink.